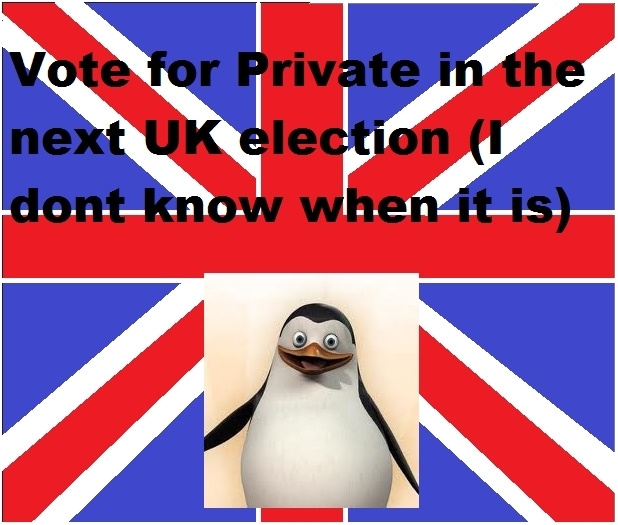 VOTE FOR PRIVATE!. I was inspired द्वारा SJF's picture to re-elect Skipper, thus me coming up of the idea for Private running for Priminister of the UK. Wallpaper and background images in the पेंग्विन्स ऑफ मॅडगास्कर club tagged: penguins of madagascar picture penguin private. I had no clue myself, but according to Wikipedia, the next UK general election will be held "On or before 11 June 2015." Good luck to Private! @Annacrombie: May 2010 has come and gone. That was when the UK held their last one, the one in which Gordon Brown was replaced by David Cameron as PM. But that's all I know -- I couldn't really tell you the specifics. It's enough work keeping up with American elections, let alone trying to follow ones abroad.